D. Monahan, “Evaluation of Servicio Hidrográfico y Oceanográfico de la Armada de Chile (SHOA ) Capability in Non-navigational Ocean Mapping”, GEBCO, Valparaiso, CHL, 2012. D. Monahan, “History and Activities of GEBCO Guiding Committee”, Symposium on Application of Marine Geophysical Data and Undersea Features. Incheon, Sudogwon, Korea, pp. 4-13, 2007. D. Monahan, “How Much of the Seafloor Has Ever Been Ensonified?”, Bathymetric Science Day: Lamont-Doherty Earth Observatory of Columbia University. Palisades, NY, USA, 2007. D. Monahan, “GEBCO and Deep Water: data assembler, converter, interpreter and disseminator”, Hydro International, vol. 11. Geomatics Information & Trading Center - GITC, Lemmers, Amsterdam, The Netherlands, pp. 7-9, 2007. D. Monahan, “Five Years of the General Bathymetric Chart of the Oceans”, International Hydrographic Organization (IHO). Monaco, Monaco, Monaco, pp. 1-18, 2007. 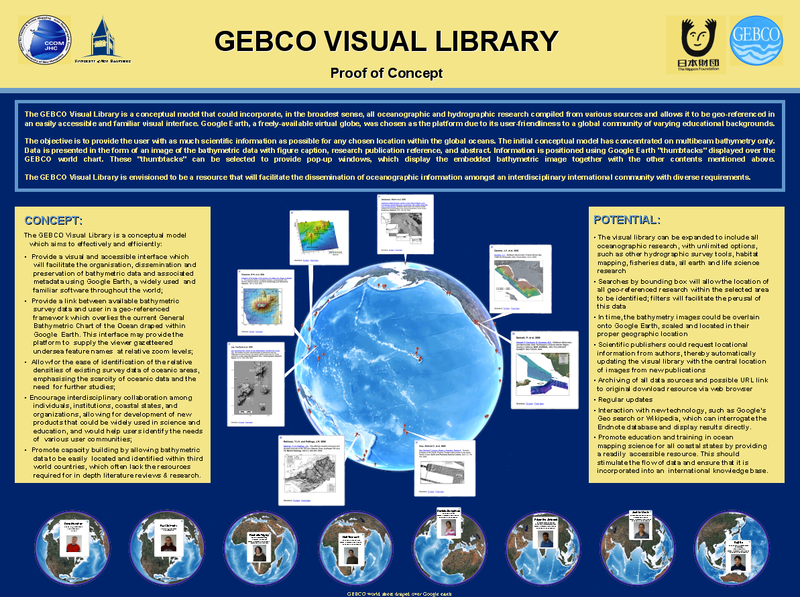 D. Monahan, “Nippon Foundation/GEBCO Training Project at the University of New Hampshire 4/2004 - 8/2005”, University of New Hampshire (UNH), Center for Coastal and Ocean Mapping (CCOM)/Joint Hydrographic Center (JHC), 2006. S. Karlipata, Monahan, D., Caceres, H. M., Morishita, T., Mustapha, A., Reynoso, W., and Sharma, S., “Capacity building in Ocean Bathymetry”, International Hydrographic Review, vol. 6. Geomatics Information & Trading Center - GITC, Lemmers, Amsterdam, The Netherlands, pp. 69-75, 2006. M. Commander Bashir, Bustamante, J. L., Hartoyo, D., Heap, B., Lagonsin, A. M., Monahan, D., Weirathmueller, M., and Yoshida, T., “How Rapidly Can Ee Respond to an Urgent Need? Producing a Bathymetry Map of the 2004 Tsunami Area”, GEBCO Bathymetric Sciences Day. Bremerhaven, Bremen, Germany, 2006. D. Monahan, “An in-depth look at shallow water multibeam”, Shallow Water Multibeam Sonar Training and Operations. St. Andrews, New Brunswick, Canada, pp. 0-0, 2005. W. H. Smith and Monahan, D., “ABYSS-Lite: A Radar Altimeter for Bathymetry, Geodesy and Mesoscale Oceanography, A Mission Concept Submitted to the NRC Decadal Survey”, University of New Hampshire (UNH), Center for Coastal and Ocean Mapping (CCOM)/Joint Hydrographic Center (JHC), 2005. R. M. Anderson, Jakobsson, M., Monahan, D., Hall, J. K., Montoro, H., and Mustapha, A., “GEBCO: A New 1:35000000 Scale Printed Map”, EOS Transactions, American Geophysical Union . San Francisco, CA, USA, pp. 0-0, 2005. D. Monahan, Poll, R. V., and Cockburn, S., “Applying the Test of Appurtenance Globally: a new inventory of wide margin states from public domain data”, International Hydrographic Review, vol. 6. Geomatics Information & Trading Center - GITC, Lemmers, Amsterdam, The Netherlands, pp. 77-84, 2005. D. Monahan, “Tsunamis and bathymetry- A little on their relationship”, Extraordinary International Hydrographic Conference, IHO (EIHC). Monaco, Monaco, Monaco, pp. 0-0, 2005. D. Monahan, Angwenyi, C., Montoro, H., Morishita, T., Abdullahi, A., Reynoso, W., and Sharma, S., “Multi-dimensional, multi-national, multi-faceted hydrographic training: the Nippon Foundation GEBCO training program at the University of New Hampshire”, U.S. Hydrographic Conference (US HYDRO). San Diego, CA, USA, pp. 0-0, 2005. D. Monahan, “Determination of the Foot of the Continental Slope as the Point of Maximum Change in the Gradient at Its Base”, in Legal and Scientific Aspects of Continental Shelf Limits, 8th ed., no. M.H Nordquist, J.N. Moore & T. Heider, Leiden, South Holland, The Netherlands: Martinus Nijhoff legacy_publishers, 2004, pp. 91-120. M. H. Cormier, de Moustier, C., Hall, J. K., Mayer, L. A., Monahan, D., and Vogt, P. R., “The Global Ocean Mapping Project (GOMap): Promoting international collaboration for a systematic, high-resolution mapping of the world's oceans”, International Geological Conference (IGC). Florence, Florence, Italy, pp. 0-0, 2004. D. Monahan, “The impacts of a non-accepted boundary claim: Russia's frontier in the Arctic Ocean”, Association of American Geographers (AAG). Boston, MA, USA, 2004. D. Monahan, “GEBCO: The Second Century. Looking Towards a General Bathymetric Chart”, Hydro International, vol. 8. Geomatics Information & Trading Center - GITC, Lemmers, Amsterdam, The Netherlands, pp. 45-47, 2004. D. Monahan, Chance, J., Dare, P., Dijkstra, S. J., Dodd, D., Howden, D., Richer, J., Santos, M., Wells, D. E., and Wiesenburg, D., “Hydrographic Learning 24/7”, U.S. Hydrographic Conference (US HYDRO). Biloxi, MS, USA, pp. 0-0, 2003.